PTP sincerely thanks all of our volunteers, group leaders, property owners, donors, and other supporters for donating their time and resources to help green our urban forests. We’ve helped over 1200 property owners get trees. UC Green, their wonderful employees and volunteers who help us at all of our plantings and pruning clubs. Sue McQueen, Joe Shapiro and Stephen McCoubrey who often volunteer for both our pruning clubs and plantings. Philadelphia Brewing Company for always hosting our lunches and helping to plant trees using their work truck. Amanda Johnson and Nick Schummer for their donation and helping us on their wedding anniversary! Thank you to Alliance for Community Trees (ACT) for sponsoring our first Fall 2010 Pruning Club event on October 17, 2010. 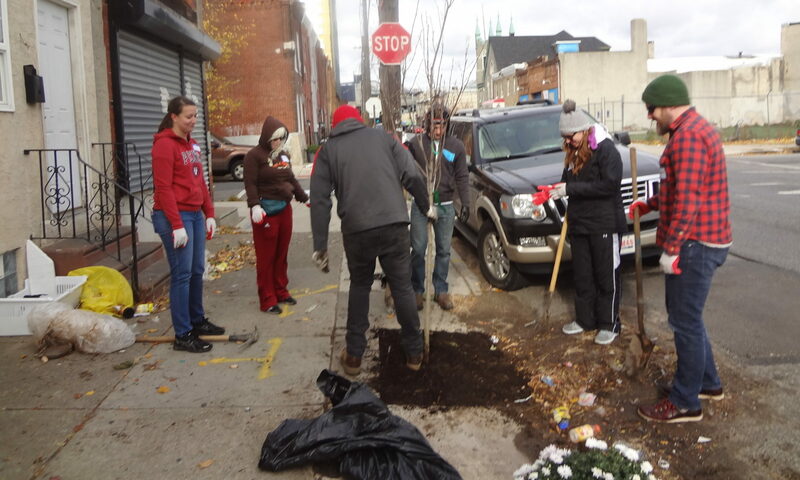 Thank you to all of our volunteers who have made this season amazing and who have helped to make EastPortFishington (East Kensington, Fishtown, Port Richmond, Greater Kensington) even more beautiful. We’ve now helped plant 313 trees in the neighborhood. Thank you to all of the friends, family and neighbors who came out to volunteer as part of Tree Planting Teams, as Photographers, as Team Leaders, our Sign In Team, and to our Food Team. Thank you to each and every person, you know who you are, who was able to take a day off from work to help with the pickup, sorting and other necessary preparation of the trees prior to their planting. Thank you to the staff of the PHS (Pennsylvania Horticultural Society) including the staff of Philadelphia Green, the Tree Tenders program and to TreeVitalize for all of your help, support, and organizing. Thank you to Nancy and Bill at the Philadelphia Brewing Company for donating the use of their space for the tree planting lunch and party. Thank you to Marlene Buck and Noah at the NKCDC for donating the use of their hand tools for our upcoming planting and for providing us with mulch and NKCDC staff assistance for planting day. Thank you to Traveling Tree Tenders, KSNAC, and Northeast Tree Tenders for coming out to help or lending tools to the effort. Thank you Primex Garden Center for donating soil to PTP and for providing us with an ongoing discount for supplies. Thank you to IPAK for lending their truck so that we could pick up the donated materials and to Carlos R. Perez for driving. Thank you to Marie Perez and Lori Frost for managing the food setup for breakfast and lunch again – it was awesome. Thank you to all of the friends, family and neighbors who came out to volunteer. Thank you to the Drexel University’s LeBow College of Business for donating water and organizing volunteers. Thank you to Marlene Buck at the NKCDC for donating the use of their hand tools for our upcoming planting and for providing us with mulch and NKCDC staff assistance for planting day. That you to IPAK for lending their truck so that we could pick up the trees and to Carlos R. Perez for packing it and driving. Thank you to UCGreen for lending us Tool Leader Bags for our tree planting as well as stake pounders. Thank you to the Port Richmond Thriftway, Located at the intersection of Aramingo Avenue and York Street, for donating 10 cases of water for our tree planting. We received a very generous $1000. donation from FMC Corporation for our groups tree planting efforts on behalf of one of their employees and one of our founding members Dina Richman. Thank you to PhillyCarShare for granting us a $250. Community Improvement grant for Tree Planting.